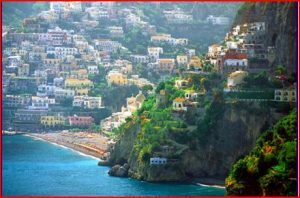 Anchoring the middle of the Amalfi Coast and lending its name to this area of the coastline, sits the town of Amalfi, Italy, a great spot to visit while on a crewed yacht charter of the Amalfi Coast. 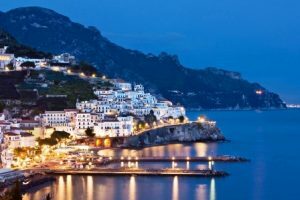 Located on the Gulf of Salerno, the Amalfi Coast stretches from one end of the southern side of the Sorrento Peninsula to the other, with the western tip of the peninsula just 9 miles from the island of Capri. 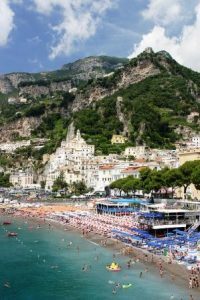 The town of Amalfi does have a harbor and some dockage available, although weather coming in from the south can sometimes make an overnight stay by yacht while on a crewed yacht charter in this harbor impossible. However, Capri is just a stone’s throw away with a protected harbor for your charter yacht to tuck into for overnight, while visiting the town of Amalfi on a crewed yacht charter of the southern side of the Sorrento Peninsula along the Amalfi Coast. Amalfi was an important maritime trading power in the Middle Ages and at one time had over 70,000 citizens. 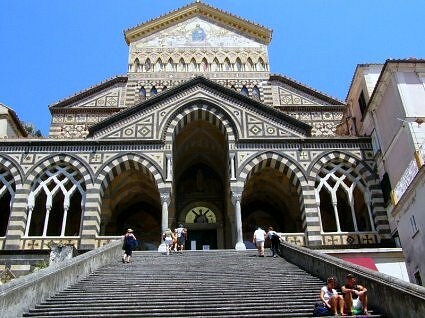 The wealth of that era is reflected in the architecture of the town, most notably in the famous Amalfi Cathedral. Amalfi flourished first independently and then under other rule until the Tsunami of 1343, which destroyed the port and lower town. Amalfi never recovered in more than local importance and slumbered along until the early 1920’s when discovered by English Aristocracy as a beautiful vacation area; bringing Amalfi back into international prominence again, but this time as a lovely resort town, which is the reputation maintained today. With a reputation as welcoming to visitors along with a strong maritime connection and history makes Amalfi a must see spot on a yacht charter itinerary of southern Italy, especially when visiting, as one does on a yacht charter, by sea. The maritime tradition is very strong in Amalfi, as this town is said to be the birthplace of Flavio Gioia, who introduced the mariner’s compass, an important navigating tool, to Europe, and indeed the maritime code, Tavole Amalfitane, developed in Amalfi was recognized in Europe until 1570. 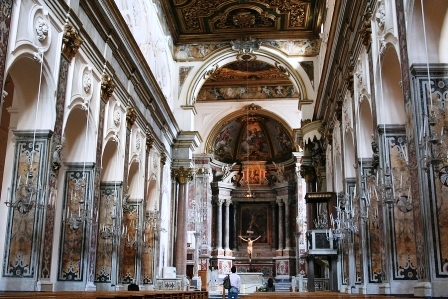 However the most important maritime connection would be certain remains of the Apostle St. Andrew, the Patron Saint of Fishermen said to rest in the crypt of the Amalfi Cathedral, the Cathedral of Saint Andrew. Overlooking the Piazza Duomo, just behind the harbor and in the heart of the town of Amalfi, the present Cathedral of Saint Andrew was built in the 1200’s, right beside the previous cathedral still standing. 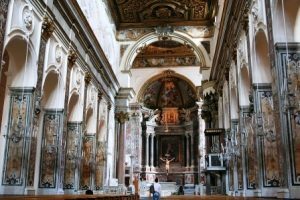 Built at the height of Medieval economic and maritime importance, in 1203, Cardinal Pietro Capuano is said to have brought the relics of St.Andrew to the cathedral crypt from Constantinople, where they remain today. Certain miracles are said to occur in the crypt where the remains are held including the gathering of a dense liquid or “Manna” as it is referred on his tomb. Visit the cathedral and the crypt and also the Cloister of Paradise with a display of medieval art. 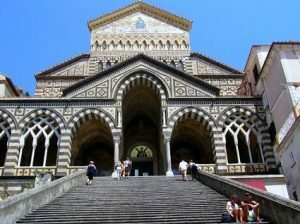 And take a look at the building itself, as notwithstanding the supposed relics and museum, the newest cathedral building from the early 1200’s is a significant example of Italian medieval architecture, with the Arab-Sicilian marble façade décor of different colored marble laid in stripes. Explore the streets of Amalfi and the little shops filled with hand painted pottery and the local liqueur Limoncello. The lemon reigns supreme on this coast, with lemons grown in virtually every field, and terrace. And the Sorrento Peninsula lemons are felt to have no superior in taste, perfume, sweetness and acidity. The importance of the lemon is seen in the hand painted pottery and tiles, which reflect the colors seen most often in this area of lemon yellow, leaf green and Mediterranean blue. So include the town of Amalfi in a yacht charter itinerary of southern Italy to explore this anchor and namesake of the Amalfi coast.